Stunning Glasgow School Arts & Crafts beaten copper and enamel mantle clock with typical stylised plant motifs and tendrils with deep blue and green "enamel", having a flat domed top and curved front legs on pad feet; the design attributed to George Walton for Goodyers of Regent St, London c1905. Approx 9.5" high and 16" wide. For reference see "The Glasgow Style" by Gerald & Celia Larner page 87 for a comparable clock. 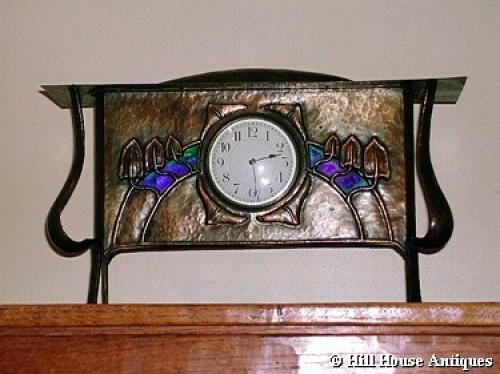 An identical clock but in brass sold at Phillips, London in November 2000.